This section highlights the following items that are important elements of rumble strip design. Designers can design rumble strips that will mitigate the crash types that are present in a corridor. Rumble strips are placed as a countermeasure for driver error, rather than roadway deficiencies. They are designed primarily to assist distracted, drowsy, or otherwise inattentive drivers who may unintentionally drift out of their lane. For this set of drivers, the audible and vibratory warning produced by rumble strips greatly improves the opportunity for a safe recovery. Where drivers don't safely recover, the warning created by rumble strips often improves driver reaction, thereby reducing crash severity. Center line rumble strips are placed as a countermeasure to assist drivers who unintentionally stray over the center line. Center line rumble strips typically reduce head-on or opposite direction sideswipe crashes, or run-off-the-road to the left crashes. Shoulder and edge line rumble strips are placed as a countermeasure to assist drivers who may unintentionally drift over the edge line. These typically reduce run-off-the-road to the right crashes, which include many rollover and fixed-object crashes. While rumble strips have been extensively used in rural areas where run-off-road crash problems exist, use on urban freeways or other roadways functionally classified as urban is also effective. 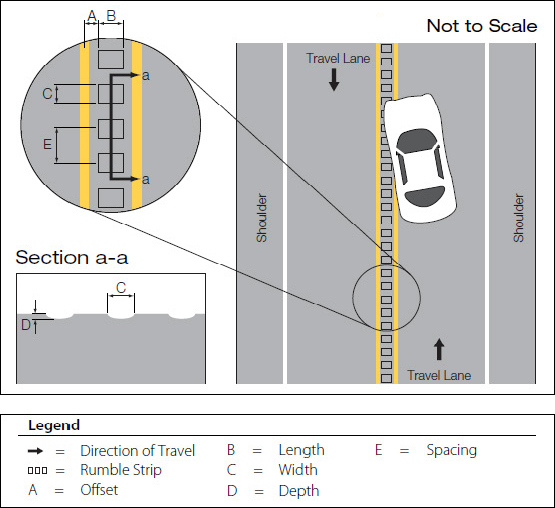 Whether the roadway is classified as rural or urban, the use of rumble strips should be determined on the merit of the cross-section and appropriate to the context. Characteristics and concerns that often limit the usefulness or application include accommodation of bicyclists, noise for adjacent residences, pavement width and depth, and access that results in significant turning movements or other conflicts. 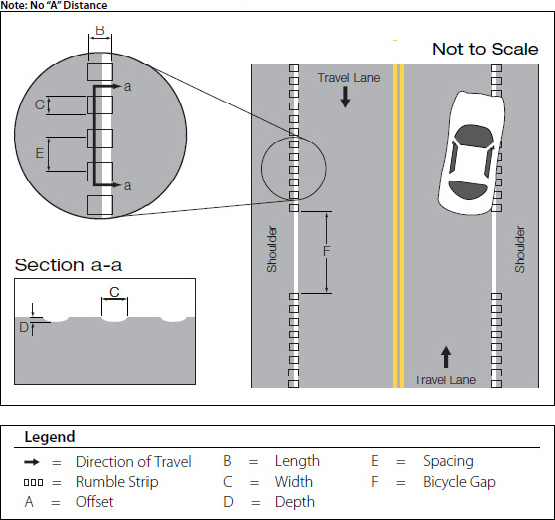 The following diagrams illustrate the terms used to denote the dimensions of rumble strips. 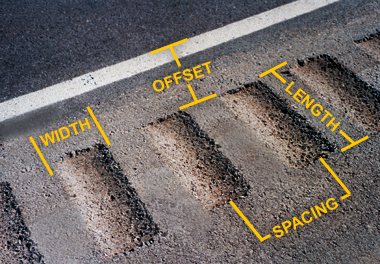 There are two primary rumble strip types: milled or raised. Research indicates the key design parameters related to alerting noise of the rumble strips are the depth and width. Milled rumble strips are the overwhelming standard of practice due to their constructability, durability, versatility, and cost. Raised rumble strips are limited to climates where snow plowing is not a common occurrence. A wide variety of shapes is possible, but the effectiveness of raised rumble strips has not been widely studied. Because they are typically epoxied to the pavement or inlaid with pavement markings, they are prone to wear or displacement. Early installations also rolled rumble strips into asphalt or formed them in concrete. Limited dimensions and constructability issues resulted in these types of rumble strips becoming obsolete. Milled rumble strips are made by a machine with a rotary cutting head, which creates a groove into the pavement. Tires passing over milled rumble strips drop into the groove, which causes tire noise and vehicle vibration. In general the wider and deeper the rumble strip, the more sound and vibration. Research indicates that different dimension milled rumble strips provide different amounts of sound and vibration in the passenger compartment. Typical milled rumble strip widths are 5 to 7 inches with 12-inch spacing and approximately 0.5 inch depth. A typical length is 12 to 16 inches, but smaller versions have become more popular on two-lane roadways. The length, width, and depth can be adjusted by using different size cutting heads and the distance between the rumble strips is also easily adjusted. Raised rumble strips are typically 2- to 12-inch-wide rounded or rectangular markers or strips that adhere to new or existing pavements. Some road agencies use "cookies" that are placed within a thermoplastic pavement marking. Others epoxy non-reflective raised pavement markers (RPMs) to the pavement. Using multiple RPMs side-by-side allows longer strips that can create more noise and vibration. New designs are being introduced to the market. Because their height can range from ¼" to ½", the use of raised rumble strips is usually restricted to warmer climates that don't require snow removal. Research is limited for raised rumble strips, but due to the smaller dimensions associated with raised rumble strips, it is likely that they provide less alerting capacity and therefore are less effective than milled rumble strips. It is common practice to include gaps in shoulder or edge line rumble strips to allow bicyclists to move between the lane and shoulder without crossing a rumble strip. Some states use a pattern that skips every third rumble for their center line rumble strips. This produces a different sound. Highway agencies often use all types of shoulder rumble strips, depending on the need and the material. The groove pattern can be installed intermittently or continuously. The groove pattern, depth, width, shape, and spacing may also change with the road agency. Several states have developed design standards for rumble strips. 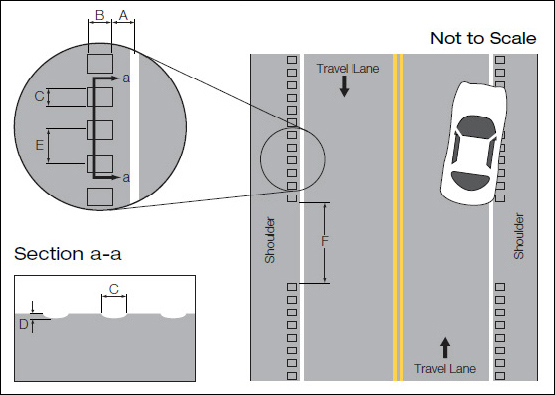 Current practices are summarized in NCHRP 641: Guidance for the Design and Application of Shoulder and Center Line Rumble Strips. While rumble strips are effective in reducing crashes, it is important to consider the impact of installation. See Accommodating All Users, Mitigating Noise and Pavement/Maintenance for more information.